There’s only a few days left in the Teespring campaign for March’s stuff. That said, I’m not giving up. It’s time to regroup a bit, look back at just how much I’ve done throughout this project, and some lessons learned. Ad libbing aside, I’ve been doing 12 Months of Stuff for 3 months. It’s hard! Some of these projects are pretty involved, almost always more than I initially think. I know if I had 3-6 months to push this t-shirt campaign I would have hit the goal by now, but trying to break down a project into action items while also juggling life, a day job, and these updates has been tough. That said, I know if I get more detailed with my project plans I can hit the ground running and have a better chance at success. 2. Always ALWAYS have and keep a schedule. When you block time for a task, there’s nothing to think about. You don’t get caught up in anything else, and it makes it easier to attack your to-do list when there’s a set time for everything. In straying from this, I find myself feeling like I have less time than I have, which leads to more stress, which leads to worse stuff overall. Not good! I noted how important this would be in month 2, and I mostly stuck to it then. I’ve trailed off on keeping a set schedule in this one and I think it’s time to get back on track for April’s stuff. 3. Don’t be afraid to change on the fly! Those Facebook ads I created plummeted performance-wise in the first day or so that they were running. I made a few tweaks and now the traffic is trending upward. It’s important to inspect & adapt and change once you realize something’s going wrong. It’s not that I didn’t anticipate the amount of work going into these monthly projects, but as I said before it’s pretty daunting to do something and do it well over 4 weeks. I’m making small tweaks where I can and going from there. And there’s still time to hit the goal for this campaign! Buy your Truth Tee now at http://truthtees.net. Remember, 25% of the profits are going to Erika’s Lighthouse. Watch the video below for more info including some more on the stuff I’ve done and lessons learned. Truth Tees available now on Teespring! 25% of profits go to charity. 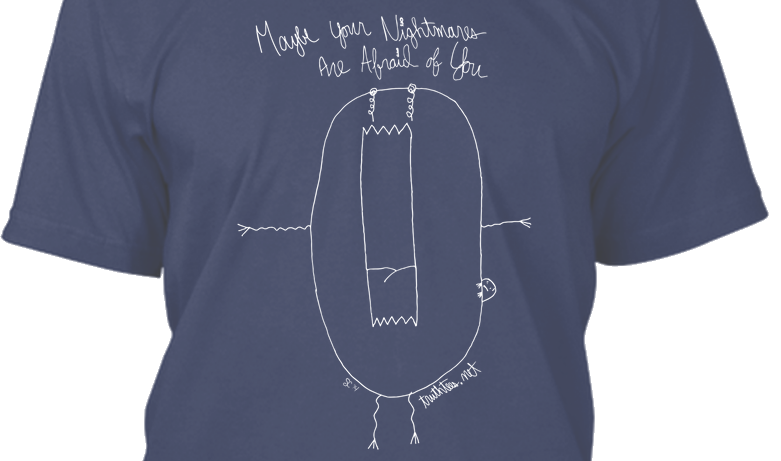 “Maybe your nightmares are afraid of you” reads this limited edition Truth Tee. I designed this t-shirt to empower people with mental health issues to take control of what they’re going through and get better one step at a time. If you change your perspective, sometimes you’ll notice that a “scary monster” is actually just protecting her child. You can snag this Truth Tee from now until March 30 at http://truthtees.net. Watch the video below for more. This drawing and saying means a lot to me and hopefully it will help someone else out there who may be going through some difficult times. I’m super excited to announce that March’s project is Truth Tees – Meaningful, hand drawn designs on t-shirts, with a % of profits going to charity. Last week I posted a song explanation for “Get Over It” — the closer on my Young Professionals split EP — which deals with mental health issues, how people perceive them, and how people experience them. The design I created (which you can get a peek at in the video below) deals with feeling empowered to take control of your mental health issues instead of them taking control of you. The most exciting part of this for me is that I found a truly awesome non-profit in the Chicago area to pair this design with. Erika’s Lighthouse. Their mission is to “educate communities about teen depression, eliminate the stigma associated with mental illness and empower teens to take charge of their mental health.” Super cool. Super necessary. Super important. Not only do they have programs to help teens get through their mental health issues, they also have programs to educate parents and friends on mental health issues too! I’m going to try to get in touch with them directly to work closer with them on this campaign. But regardless of how that shakes out, if this campaign succeeds they are the ‘charity in residence’ (not an official term) so to speak, for this run of Truth Tees. For the first two weeks of March, I’m going to focus on planning and trying to make sure the campaign gets off on the right foot. For the last two, I’ll run and promote the campaign. Stay tuned to the blog or my YouTube channel for more info soon. 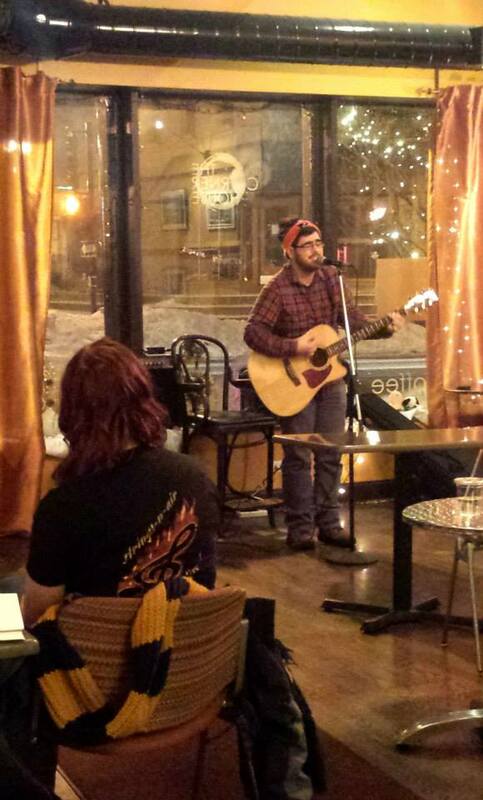 Me, performing at the Spilled Milk Open Mic at the Corner House. February’s project was releasing a split EP with my buddy Brian in A Day Without Love. We dubbed it the Young Professionals EP. The EP was recorded over Christmas break, so there wasn’t much to be done as far as mixing. This project was about promotion, building some buzz, and releasing music I’m proud of. And of course, I aimed to learn as much as possible along the way. That breaks down to 9 YouTube videos, 6 blog posts, 3 of my songs on iTunes, Spotify, and Bandcamp, and other digital services, 1 open mic, and a lot of hard work :). Overall, I’m pleased with my first month of stuff. I haven’t focused on music so exclusively for a long time, and it felt good to put some time into it. The response to the EP surpassed my expectations, particularly the feedback on a lot of my video content. There will be more musical months to come in this, the 12 Months of Stuff. But I have a feeling even after 2015 is done, I’ll still be working music into my daily routine, from songwriting to performing. I learned a lot over this past month, and I’ll expand on that in depth recap on specific topics. But for now, my key takeaway from my first month of stuff is this: I have much more time than I think. There’s no doubt I lost sleep over some of these videos, posts, and parts of this EP. The week of release with six YouTube videos and an open mic was particularly challenging. So much so that as you may notice, I took a few days off from March’s project. But at the end of the day, I got it all done. I silenced the small voice in the back of my head that constantly chattered about running out of time. Looking towards future projects with this in mind is one of the most rewarding parts of this project so far. Lastly, if you’re reading this, thank you! Thank you to everyone who listened to my EP (even if you didn’t dig it 😛 ), posted on socials about it, watched and shared my videos, and gave me words of encouragement on the EP and project as a whole. It means a lot to have my hard work recognized, and I hope I can keep you coming back for more cool stuff in March and beyond. And remember, if you want to get to where you want to be, it starts with that first step :). Subscribe to the blog, my YouTube channel, or follow me on Twitter to keep up with my 12 Months of Stuff! I’ll have more info on March’s project tomorrow.